Where some games develop their own worlds, histories, and legends, those of Never Alone are authentic, which adds a substantial layer to gameplay. 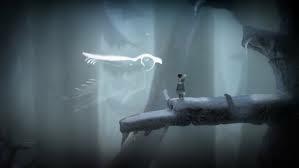 Its gameplay, art, and story were designed and developed in conjunction with the Inupiaq people. The land, spirits and the numinous objects Nuna encounters are all based on reality. The storyline described above is an Inupiaq legend, as are the parts and pieces, fantastical and otherwise, that fit it out. For players wanting additional layers, bonus material is unlocked (by tracking down owls semi-hidden throughout the game) in the form of video vignettes featuring modern-day Inupiaq people and their traditions. Like Valiant Hearts and its delving into WWI history, this additional content can be skipped, but for those who take the time, it provides a cultural backdrop to the game, including clues how to get past certain puzzles, and ultimately boosts video games can sometimes be cultural experiences as much as entertainment. 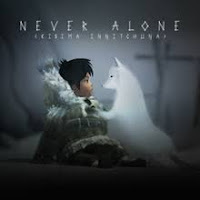 Included in the Never Alone bundle available on the PS Store is its lone expansion (thus far) called “Foxtales”. Adding one-and-a-half hours of gameplay (to a roughly four-hour base game), it features a new mini-storyline with Nuna and the fox. Playing near the sea one day, the two accidentally push a mouse into some fast moving rapids, and need to rescue it. New skills introduced, like paddling a boat and throwing ice blocks, the pair must work their way through the obstacles to rescue the mouse (even if in the end it proves not as small and cute as they imagined). For players who enjoyed the base game, the expansion delivers a totally new experience that works in highly complementary fashion. I don’t think we’ll see more expansions, but I would like to given the quality of “Foxtales”. If there is anything askew with the game, it would be controls. Though not gamebreaking, maneuvering Nuna and the fox can at times, however, be an inconsistent experience. There are occasional moments getting the characters to do what you want is less a fight with bad guys or obstacles and more a fight getting the character to stand in the exact spot that would not trigger an unwanted animation to make the next move. Grab points and wall climbs were usually good, but walking on moveable objects or near precipices would sometimes cause Nuna or the fox to fall or not fall when you wanted one not the other to happen. And there were problems with clipping with some objects. But again, as occasionally frustrating as these problems could be, they don’t spoil the overall experience, nor prevent players from progressing. In the end, Never Alone, including the expansion “Foxtales”, is not the most complex puzzle game ever made. But it does require lateral thinking and cooperation with a teammate (which in itself can add intangible levels of difficulty) and in the end is fun—the ultimate yard stick for any game. Ideal for parents wanting to play and problem solve with their children, it makes for a great family game. And this is all without saying the wide-brush art style and its color palette of icy blues, snowy whites, tundra browns and grays, and the neon of the aurora borealis wonderfully complement the integration of Inupiaq myth and legend. All these elements adding layers of depth to what could have been a simple affair, it’s wonderful to see indie developers keeping lo-fi gaming alive and well.